BoJack Horseman is a television show that’s fearless in not only the topics that it tells stories about, but the ways in which it tells them. The series has almost made it an unofficial tradition to feature one “big” episode each season that’s especially ambitious in terms of its structure. These experiments have resulted in silent episodes, nonlinear entries that explore the messiness of addiction, or a devastating take on the pains of mental illness. In spite of all of those previous accomplishments, BoJack’s “Free Churro” from its fifth season feels particularly risky and unique. Death may not seem like a natural topic for comedies to tackle, but it’s an important area that deserves exploration. There have been plenty of memorable episodes of sitcoms that deal with death in big ways, such as The Wonder Years’ “Goodbye,” The Mary Tyler Moore Show’s “Chuckles Bites the Dust,” or even something more creative like How I Met Your Mother’s “Last Words.” That said, BoJack Horseman zeroes in on the topic in an honest, uncomfortable way that’s arguably never been done before in a comedy — or a drama, for that matter. Perhaps the closest that another comedy has gotten to what BoJack Horseman achieves with “Free Churro” is either NewsRadio’s heartbreaking “Bill Moves On” or Community’s “Cooperative Polygraphy.” These are both bottle episodes that allow their characters to stew with their grief over a lost life (and in the case of the former, the real-life death of a cast member). BoJack Horseman goes one step further with its focus: It not only concentrates on a character’s eulogy, but the episode is the character’s eulogy for the entire running time. It’s a 25-minute one-man show where a character delivers a powerful, moving monologue about death and loss that doesn’t allow itself a reprieve. This installment of BoJack Horseman operates on a provoking, challenging literary scale, but then strives to push the envelope even further. During one stretch, BoJack comments upon the eulogy that his mother delivered when his father died: “My husband is dead and everything’s worse now.” The meaning of her words completely evades him as BoJack attempts interpretation. This moment and many others pose questions about grief, loss, and mourning, while not providing the relief of answers. An insurmountable amount of doubt is raised as the episode continues, and it eloquently comments on how nobody really has the answers when it comes to death. “Free Churro” exhibits a unique stream-of-consciousness quality that gives the episode’s rawness an added edge. When it devotes a ten-minute conversation to the various meanings and interpretations behind a simple phrase like “I see you,” it feels like a precarious tightrope walk that could end in disaster at any moment. The episode allows no escape from BoJack’s free-falling grief, and opts for a morbidly dark monologue instead of a respectful eulogy, but at times it achieves both. BoJack’s eulogy morphs into an uncomfortably pitch-black stand-up routine, complete with rim shots and offstage sound effects. It’s a performance. BoJack is a character who’s so entrenched and raised by television, the medium has become his means for processing pain and deeper emotions. Of course, the rules that TV establishes are impossible to live up to in real life. Television makes us believe that parents are infallible and that they will be good and considerate, but reality is never so clear-cut. Perhaps BoJack even pursued a life in network television so he could finally attain that picturesque family that’s impossible in real life. If sitcoms aren’t allowed to have happy endings because they’re meant to run forever, then BoJack Horseman at least dissects the nature of happiness and growth. BoJack may end his eulogy feeling alone, but this show is special because it’s never going to give up on that happy ending. Furthermore, the episode’s opening scene, which is the only moment that exists outside of the funeral home, flashes back to an important moment from BoJack’s youth. It’s telling that in spite of how “Free Churro” is all about BoJack’s relationship with his mother, this scene is an exchange between a young BoJack and his father, Butterscotch (also voiced by Arnett). Rather than juxtapose a memory of BoJack’s mother with his eulogy, the episode chooses the harsher decision to not feature her at all. She may not be in this opening scene with BoJack and her husband, but the first thing that Butterscotch says is, “Your mother’s having another one of her episodes,” before he goes off on a nonstop rant where “the black hole that birthed BoJack” is very much the subject of ridicule. The fact that Beatrice isn’t there to defend herself — whether in the car with her husband or during BoJack’s eulogy — is emblematic of her life as a whole. In spite of this episode’s marginalization of Beatrice Horseman, perhaps its most beautiful moment is when it celebrates her through a brief, stylistic departure. As BoJack reflects on his mother’s dancing — the one act that could bring his fractured family together — the beauty of it nearly lifts him from the funeral parlor and transports him to a dance recital, but it can’t quite fully take him away. “It’s amazing how cinematic that moment is, and it’s just a camera push and a shadow on the wall,” says Bob-Waksberg. As BoJack rounds up his thoughts, there’s a gutting conclusion to the pivotal, lengthy “I see you” anecdote. BoJack stumbles onto the realization that his mother wasn’t really acknowledging him at all, but rather commenting on her status in the intensive care unit — the ICU. All that BoJack ever wanted in his life was for his mother to see him, and it’s this act of eulogizing that causes him to understand that she never really did. The final words that his mother said to BoJack gave him incredible clarity, but in the end, it doesn’t really matter if he misinterpreted them. This is the honest, messy, flawed way that BoJack grieves over his mother, and whatever he does in this moment will be authentic because there’s no “right” way to grieve. “Free Churro” is a triumph of BoJack Horseman and television in general because it approaches the incredibly personal process of grieving with unflinching bluntness and honesty. 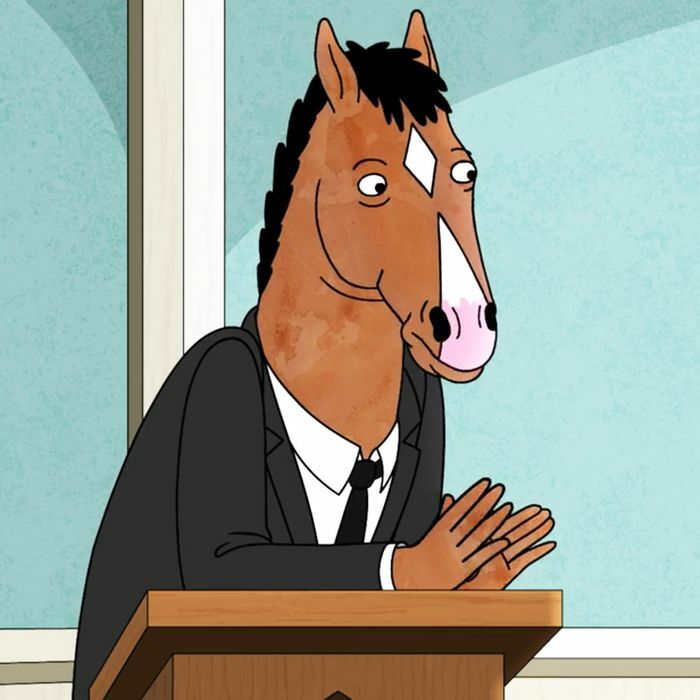 It doesn’t instruct its audience on how to give the perfect eulogy, and the death of BoJack’s mother doesn’t irrevocably change him into someone different. This is an episode that proves loss and grief should be messy and imperfect and reflections of ourselves. “Free Churro” isn’t the saddest episode of BoJack Horseman, and it’s certainly not the funniest, but it’s honest about the uncertain, unscripted grief in our lives that eventually affects everyone. Before BoJack Horseman, no one ever told the world that when your mom dies you get a free churro, or that losing a parent is a lot like the Ted Danson sitcom Becker. As stupid as that sounds, it’s also shockingly perfect preparation for the great unknown.